If you have access to a car while in Rome, give yourself a treat and take an excursion to Borgo di Tragliata. 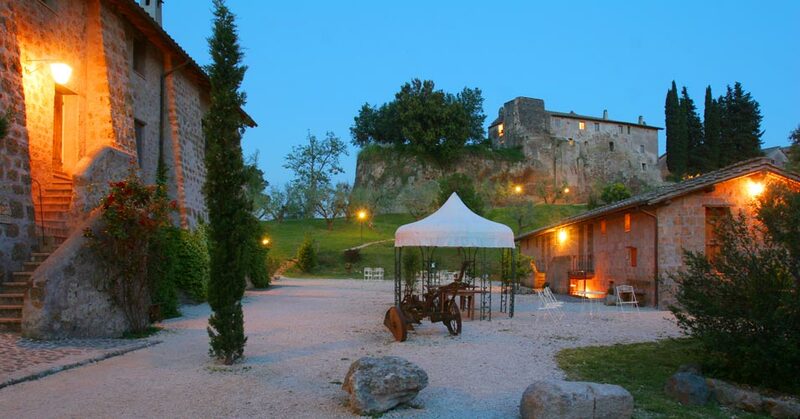 ‘An ancient semi fortified village (borgo) dating from 928 AD, on a large estate 17 km. north of Rome, it stands like a sentinel in the enchanted and unspoilt Etruscan countryside close to the seaside. The location has great suggestion, offering a combination of open countryside and deep Etruscan ravines. Inside the borgo, several apartments, all elegantly furnished, cluster harmoniously around a grassy courtyard, with a church, a working medieval bread oven and a tavern for guests.’ So says the website (still under development) and who am I to argue. The setting is certainly magnificent, with the ancient keep situated on the top of a precipitous poggio, or hill. Even if you don’t stay there, and the apartments are really intended for bookings of a week or more, the restaurant (rather more elegant than a tavern) is well worth the visit. We were there on New Year’s day and enjoyed a sumptuous set menu of about five courses, based on fresh produce (most of it either grown or reared within sight of the restaurant) and washed down with local wine. The cooking was exquisite and the cost was about £10 per head (why would anyone want to live anywhere but Italy, we ask ourselves yet again). In the summer a large terrace offers fabulous views across the countryside – it’s almost impossible to believe that Rome’s main airport is only 15 minutes away.